Time for a good old fashioned “Show us your Springfield!” For this round of Springfield Showoff, I want to see your favorite parts of Springfield. 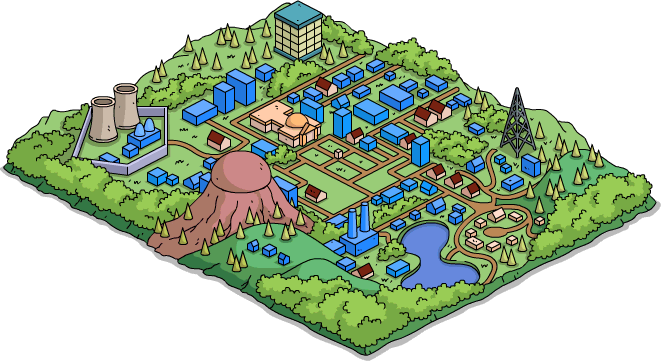 I want to see how creative you are, which areas of your town are your favorite, and how you incorporate stuff into Springfield! So it’s a true TSTO Smorgasbord! It can always be a little intimidating and frustrating trying to figure out just where to put anything in Springfield…so who better to turn to than our fellow Addicts? And as always you guys came through big time! I tried to get everyone that I saw into the showoff. Even a few that arrived after the deadline (since I pushed back the posting time I accepted the few that arrived beyond the 8pm cutoff). If I missed yours I’m sorry! And please remember only send 1 or 2 images. If you send more I just pick 2 randomly and they may not be your 2 favorites…. Whew! You guys really liked showing off your towns and we loved checking them out! You all did such a great job…you gave us some great ideas! What did you all think of your fellow Addict’s designs? Sound off in the comments below, you know we love hearing from you! This entry was posted in Buildings, Decorations, Springfield Showoff, Updates and tagged Random TSTO Designs, Tapped Out Design ideas, Tapped Out Tips and Tricks, The Simpsons Tapped Out, TSTO Addicts, TSTO Designs, TSTO Tips and Tricks. Bookmark the permalink. Aww damn! I really need to get myself together and get my entries in … Next time! Wow — these are all so great! I’m one of those many, many people who stockpiled new buildings and characters. They’re currently just sitting in random areas without any thought of design. I need to gas up my get-go and get back to planning out Springfield! Love Santos’ vision of the reuinion…and the maze! Wow! I second that! I was also contemplating an area away from the H.S. for my reunion since they didn’t really go together, probably on the boardwalk but this looks so much better than anything I was thinking and the roast pig spit is the piece de resistance. Love it! I didn’t think they could be used at the same time, but I guess since it’s M&H and the younger versions, we have our Back to the Future moment. Even though its 6 days after the showoff, I still want to say thanks ebron and SB GIBBS for your kind words. I was surprised to see a few designs on the high school and the reunion items because I thought I would’ve been the only one to send the reunion items in. ebron, I love your serfsons village and academy campus along with the little details you have used like the sheep at the butchery and the garden area next to the academy. With the recent mystery box I got the elf hotel and serfsons house which I hope will be enough to create my own village since I have treestache and his grove but nowhere to put it yet (I don’t want to store it since I always send him on the task to produce nature items). SB GIBBS, I can’t remember who but some people somewhere mentioned adding the pig to the reunion set up to show that they still follow the dialogue. I originally wanted to get all the young characters along with present M&H in the pic so young Artie dancing, young Barney “drinking”, prom Homer at the photo booth and young Marge either showing her independence or skating her heart out at the reunion area. I sent two photos well before the deadline. Did you not receive them? I’m wondering if they landed in your SPAM box. I’ve been having trouble with that happening lately. I posted everything I saw, with the exception of 1 person (whom i emailed) because I couldn’t open their photos. Just checked Spam and searched the inbox again and don’t see any additional showoff photos. Very strange! I emailed Patric the screen capture of what I sent. Maybe I typed the submission email address wrong??? No, I originally mailed it to the address you listed. I just took a screen shot of my e-mail to you and sent it to Patric who is forwarding it to you. I was curious if I typed in your email address incorrectly. Throw in the great and didn’t fix the an. quite a bit of time to complete. Great designs all. I really liked the Easter parade down Main Street. I am going to steal that idea!